The Environmental Protection Agency has cut three furlough days from the total its employees must take, according to an internal memo. The change will go into effect during the second phase of unpaid leave -- from June 16 through Sept. 30 -- and will bring the total number of furlough days to slightly less than seven. 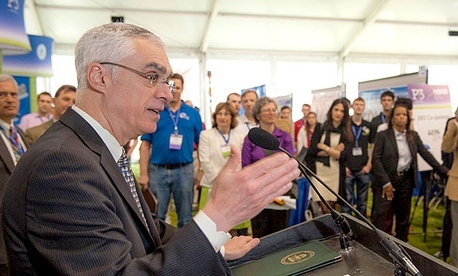 “We have worked hard to carefully and comprehensively review our resources and our priorities again, with a focus on minimizing furloughs,” acting Administrator Bob Perciasepe wrote in a memo to employees. EPA has required all employees to take 32 hours of unpaid leave during the first phase, which lasts through June 15. The agency had its first departmentwide furlough day Friday, and has two more scheduled for phase two. In total, the 17,000 EPA workers will have to take 55 furlough hours in the current fiscal year. “From the day sequestration went into effect, the No. 1 priority of EPA’s senior leadership has been to minimize the burden on EPA employees, while still enabling the agency to meet our obligations and fulfill our mission,” Perciasepe wrote in the memo. “For our agency to continue to protect the health and environment of the American people, there are certain items we simply cannot cut any further,” the acting administrator wrote, adding non-payroll cuts have accounted for nearly 80 percent of sequestration cuts. Perciasepe held a town hall meeting Thursday to discuss the furlough plan with agency employees.